Buy Now: CD – 13 tracks/48 mins. Atmospheric psychexotica. Pocket sleeve in translucent red lino block printed envelope w/ 3-pack of pin back buttons. Also available in a convenient digital format at BANDCAMP. Next week we’re releasing MOONWOOD‘s new 13-track album The Strength Of The Pack Is The Wolf, And The Strength Of The Wolf Is The Pack on CD and digital. The CD will come in deluxe lino-block printed translucent envelope which will also contain this attractive 3-pack of pins! Price: $7 door. / $0 with festival pass. Both Moonwood and BABEL have new web presences on the web. They can be found at the links in the first sentence of this post. Both sites feature the usual updates about what Moonwood and BABEL are up to (news tracks, videos, live dates, etc) but additionally the Moonwood site now houses the “Live Rehearsals” series (which used to be posted here) and the BABEL site features an ongoing radio/tape/media collage project called TRANZMIT. Moonwood also has a new CBC Music page. 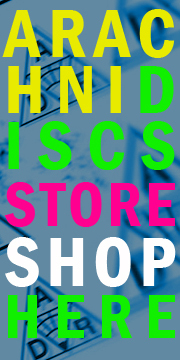 You are currently browsing the ARACHNIDISCS RECORDINGS blog archives for May, 2012.